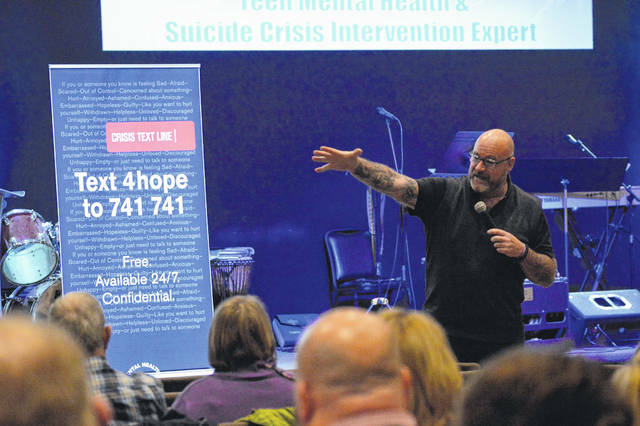 Suicide and crisis intervention professional Jeff Yalden addresses audience members at River City Fellowship Church. GALLIPOLIS — Suicide prevention professional Jeff Yalden spent the last few days meeting with students at River Valley High School and Middle School, Gallia Academy High and Middle Schools as well as South Gallia, as he sought to spread a message of awareness and prevention in a partnership with Gallia Citizens for Prevention and Recovery. Yalden also took a moment to address adult community members and youth Thursday evening at River City Fellowship Church in Gallipolis. Pastor John O’Brien welcomed visitors to the church. Executive Director of the Board of Gallia-Jackson-Meigs Board of Alcohol, Drug Addiction and Mental Health Services Robin Harris spoke briefly of the importance of assisting area agencies in the pursuit of mental health services and how it benefited the everyday lives of area residents. Gallia Citizens for Prevention and Recovery Chairman Thom Mollohan introduced Yalden. Yalden has been featured as a life coach on MTV’s Made television show as well as spoken with groups of people in all 50 states of the US, 48 countries and more. He has made it a life mission to prevent teen suicide and raise awareness to improve community responses to mental health and outreach. He has commonly worked with schools and teachers over the past several years while also having published several books and has been featured in nationally published magazines and more. Yalden emphasized the importance of spending time with family, minimizing exposure to social media while recognizing its strengths and loving children unconditionally. He encouraged listeners to be aware of the signs of potential depression as well as to watch for signs of substance abuse. Instead of yelling and chastising, he encouraged families to ask questions and listen. He encouraged parents to hold their children accountable but be sensitive to a teenager’s viewpoints as they often “lived in the moment.” What might not seem like the end of the world to an adult may be a pivotal life moment for a young person. Yalden encouraged parents to be the “trusted” person in their child’s life while also giving their child power and ownership of their lives. He encouraged a change in culture, to be open and understanding of those who struggle with mental health and to ask how others were feeling instead of condemning them for a condition that is not their fault.